For many, their first introduction to Zinfandel is white Zinfandel. Made from the Zinfandel grape, white Zin is an off-dry or sweet, low-alcohol, inexpensive, mass-produced blush wine. Sadly, many wine drinkers never try Zinfandel after this experience, assuming the grape only yields sweet pink wines of little character. What a tragedy this is, that so many miss out on the powerful, heady, explosive flavors of juicy Zinfandel wines. While the Zinfandel grape can yield the popular blush wine favored among many, it's hard to imagine a more different introduction to this grape from its actual character. Zinfandel grapes are a hearty red grape that, when made in the red wine style, yield flavorful, powerful, full-bodied red wines that are often high-alcohol powerhouses. How can one grape make two wines of such different characters? The story starts in Europe in about 6000 BCE. As human beings domesticated wine grapes in around 6000 BCE along the border of Europe and Asia, viticulture quickly spread to the Mediterranean and surrounding areas, where sunny climes yielded ideal conditions for growing powerfully flavored grapes. The earliest signs of a Zinfandel-like grape appeared in Croatia, and in the 19th century, Croatian winemaking centered almost entirely on Zinfandel-related grapes. Unfortunately, the phylloxera epidemic late in that century killed many of the countries Zinfandel varieties, leaving only a few where there were once many. Nine variations of grapes similar to Zinfandel remain in Croatia in current times. Italy's Primitivo grape, which grew to winemaking popularity in the 18th century, most likey came from this Croatian stock. Primitivo is believed to be the Italian version of American Zinfandel. In the early 1800s, Zinfandel arrived in America, most likely from the Austrian Imperial Nursery. Austria's Zinfandel vines can be traced to when the country's Hasburg Monarchy ruled Croatia between the 13th and 18th century. The vine originally took root on Long Island, and then worked its way west, until it found its home in Califorina, where growing conditions worked in perfect synergy with the grape. Today, Zinfandel accounts for more than 10 percent of California's vineyards. California wineries produce white Zin and Zinfandel wines at a ratio of about 6:1. White Zinfandel is often sweet and floral. It is a very easy-drinking, light-bodied, quaffable wine with flavor that matches almost any food with which you serve it. 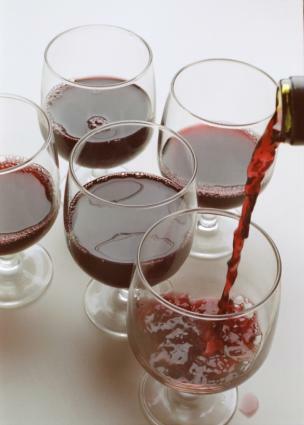 The lightness of the wine accounts for much of the wine's popularity in the United States. Red Zinfandel, on the other hand, is another story all together. The high sugar grapes yield pink juice, that when left in contact with the skins, gain a dark red color. As the sugar interacts with the yeast during fermentation, alcohol content rises and sweetness delcines. Red Zins are dry and among the highest alcohol content red wines you can find. The wines are often full of heady, jammy flavors of berries and pepper. The alcohol content packs a punch, and the dry wine's tannins can be soft or bold, depending on the style of the wine. Zinfandel's driness, spicy character and fruity flavors result in a wine that stands up well to spicy foods. Zinfandel pairs well with pizza, lasagna, pasta with red sauce, sausage and peppers, and similar boldly flavored foods. It also pairs very well with fatty steaks, grilled meats, and barbecue. California produces some of the best Zinfandels in the world. Give these winemakers a try. If you've never moved beyond white Zinfandel but love red wine, then give juicy, jammy Zinfandel a try. The powerful reds will make a wonderful addition to your wine starting rotation.